The original plan for Portal 2 was to literally bring players into the past of Aperture Science. 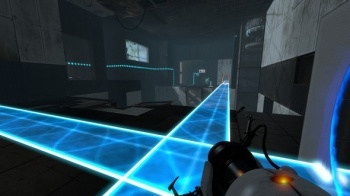 This post contains spoilers for Portal 2, as if you haven't played it yet. Valve already revealed that it was originally going to take portals out of Portal 2, but did you know the game was also meant to take place in a completely different time period? Portal 2 writers Chet Faliszek and Jay Pinkerton revealed in a recent interview that the game nearly included nothing that we knew and loved from the original Portal, because none of it existed yet. Speaking to Rock, Paper, Shotgun, Pinkerton said that Cave Johnson, founder of Aperture Science featured in Portal 2, was once a much more important character in the game. "At one point two years ago some Cave Johnson dialogue got leaked - so I can now tell you, two years ago Cave was the bad guy in Portal 2 and GLaDOS wasn't in the game," he said. "It was a prequel. We liked the character enough that we snuck him into this." Anyone that's played Portal 2 could guess as much. The game's sections in the "past" that use Aperture Science gels at first seem like they were tacked on, but eventually make more sense as you get into them. Faliszek added that people just couldn't stand to live without GLaDOS, Chell, and the Companion Cube. "People wanted more portals, they wanted GLaDOS, they wanted to be Chell," he said. The idea of taking Portal into the past just wasn't going to work, so Valve melded its work with the present Portal time period for the final version of Portal 2. I think it was a great decision, because not only do we get to be insulted by GLaDOS again in Portal 2, but we get to learn how she (and Aperture Science) came to be. Cave Johnson is no GLaDOS, but he's demented in his own way, so the combination of the two works pretty well.